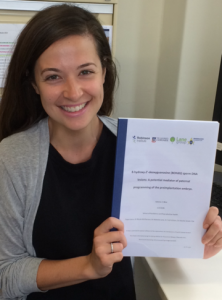 Congratulations to Edwina Blue on being awarded First Class Honours for her thesis entitled “8-hydroxy-2′-deoxyguanosine (8OHdG) sperm DNA lesions: A potential mediator of paternal programming of the pre-implantation embryo”. Edwina was supervised by Dr Nicole McPherson and Dr Michelle Lane in the Gamete and Embryo Biology Laboratory, University of Adelaide, and was a recipient of a Freemasons Foundation Scholarship to look at the role of paternal health, and in particular obesity, on the health of sperm and offspring. Obesity in males is rapidly approaching almost 70% in developed nations. Obesity not only instigates a range of health problems within the individual but deleteriously impacts on fertility, pregnancy and the health of the next generation (offspring). Oxidative stress in cells is when there is an imbalance between the production of free radicals (or reactive oxygen species), which are highly reactive molecules, and their rate of detoxification by antioxidants to reduce their harmful effects. Edwina investigated whether the effects of obesity on embryos and offspring is directly related to obesity induced oxidative stress in sperm, which has been suggested by cell culture studies, but not confirmed in animals. Male mice were fed a high fat diet for 10 weeks which led to increased adiposity. This adiposity, a measure of obesity, was significantly positively correlated with increased reactive oxygen species in sperm. This increase in oxidative stress resulted in a significant increase in lesions on sperm DNA (called 8OHdG lesions) compared to sperm DNA from non-obese mice. Edwina then emulated this association between oxidative stress and 8OHdG DNA lesions in sperm by exposing sperm cells in culture to increasing concentrations of reactive oxygen species. Also, embryos resulting from high fat diet fed mouse sperm also displayed increased 8OHdG DNA lesions compared to embryos fertilised from normal weight male mice suggesting that at least a proportion of the 8OHdG DNA lesions remain after fertilization. In conclusion, Edwina’s data implicates 8OHdG as a mark that is added to sperm DNA in response to obesity induced oxidative stress and appears to remain in the early embryo demonstrating its potential as a contributing mechanism to transmission of paternal obesity effects to the next generation. Edwina was a Health Sciences Graduate of the University of Adelaide and undertook a Freemasons Foundation Centre for Men’s Health Summer Vacation Research placement in 2013/14 which inspired her to undertake an Honours program. We congratulate Edwina on recently been appointed as Junior Embryologist at City Fertility at Western Community Hospital. This is a great outcome of her hard work and dedication. This entry was posted in News, Research and tagged obesity, paternal health, reproductive health, sperm. Bookmark the permalink.